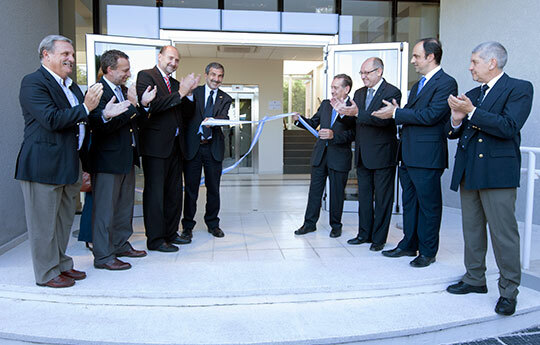 The new building of the INCAPE, which covers an area of 1,790 square meters was opened. It required an investment of ARS$21,532,010, which was co-financed between the CONICET and the MINCyT. Authorities during the inauguration. Photo: CONICET Photography. Through videoconferencing, President Cristina Fernández de Kirchner presented the inauguration of the new headquarters of the Instituto de Investigaciones en Catálisis y Petroquímica “Ing. José Miguel Parera” (INCAPE), which is under the scope of the National Scientific and Technical Research Council (CONICET) and the Universidad Nacional del Litoral (UNL). The event was presented by the minister of Science Technology and Productive Innovation, Dr. Lino Barañao and the president of the CONICET, Dr. Roberto Salvarezza at the premises of the Scientific and Technological Centre of Santa Fe. The building is divided in two parts- each of them of 895 square meters and two areas, one for specific research, and another for government, administration and teaching activities. In the area of research, there are 16 laboratories on the first floor and 16 offices for researchers on the second floor. “The INCAPE is the most important catalyzation institute of Latin America and we are opening it in Argentina, in the province of Santa Fe”, the President said. For his part, minister Lino Barañao commented that “the INCAPE developments are easy to be included in manufacture and can be used in the production of more ecological fuels, derivatives of petrol, biomass, synthesis of chemical compounds for industry, inter alia”. Regarding this, Dr. Salvarezza said “to inaugurate this building means that we are dealing with an unresolved issue for the researchers after decades of infrastructure problems. Today we have an opportunity to create appropriate environments for research and this is part of these ten years of expansion of the scientific and technological system. For this reason, we also want to emphasize the relationship with the university and our commitment to continue coordinating activities”. The Works Plan for Science and Technology in Santa Fe includes 22 works of which 19 have already been executed and 3 are under construction. Apart from the INCAPE, there are 7 new headquarters: the Instituto de Matemática Aplicada del Litoral (IMAL); the Instituto Nacional de Limnología (INALI); the Centro Internacional de Métodos Computacionales en Ingeniería (CIMEC); the Centro Internacional Franco-Argentino de Ciencias dela Información y Sistemas (CIFASIS); the Instituto de Física de Rosario (IFIR); and the Instituto de Química de Rosario (IQUIR). The province of Santa Fe now has more than 17.000 square meters of new research institutes thanks to an investment of ARS$159,244,135 within the framework of the Plan. There are more than 750 researchers and 840 fellows in working in that province. The event was attended by the director of the CCT Santa Fe, Dra. Raquel Chan; the director of the INCAPE, Dr. Ulises Sedran; the vice-chancellor of the UNL, Albor Cantard; and the national deputy and the official shortlisted province candidate, Omar Perotti. This institution specializes in the highest scientific research into the field of the chemical, petrochemical industries and the catalytic processes in particular. Apart from the training of specialized human resources, it transfers the results of the studies to the productive sector. Its lines of work cover oil refining processes; the development of catalysts and new processes for better utilization of energy resources; biomass resource assessment; and design, development and use of non-conventional reactors, inter alia. The INCAPE is considered as the most important research and development institute of catalysis in Latin America. It has more than 70 researchers, 37 fellows and 3 administrative staff.